The second installent in Raw Thrills' Super Bikes series, Super Bikes 2 is once again inspired after the popular "Fast and the Furious" movies (however this title no longer carries the "Fast and the Furious" license. The game features a 42" LCD screen, 10 never-before seen tracks, and an all new light show and effects. Race through Moab as fighter jets attack UFOs, descend into the haunted catacombs of Paris, and dodge giant worms in hyperspace. Escape elephants in the jungles of Thailand, jump through the flaming hoops of Vegas, run with the bulls in Spain and cruise through the unbelievable snow-covered mountaintops of the Himalayas. Choose from 9 riders and 12 bikes with multiple tricked-out upgrades for engines, decals, tires and more. Players can create a unique PIN to save and track their statistics. Super Bikes 2 retains all the exciting components as the original Super Bikes, and is built on a highly reliable system featuring RIO and DELL computers. The second installent in Raw Thrills' Super Bikes series, Super Bikes 2 is once again inspired after the popular "Fast and the Furious" movies (however this title no longer carries the "Fast and the Furious" license. 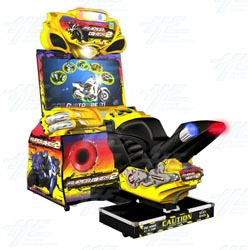 The game features a 42" LCD screen, 10 never-before seen tracks, and an all new light show and effects. Race through Moab as fighter jets attack UFOs, descend into the haunted catacombs of Paris, and dodge giant worms in hyperspace. Escape elephants in the jungles of Thailand, jump through the flaming hoops of Vegas, run with the bulls in Spain and cruise through the unbelievable snow-covered mountaintops of the Himalayas. Choose from 9 riders and 12 bikes with multiple tricked-out upgrades for engines, decals, tires and more. Players can create a unique PIN to save and track their statistics. Super Bikes 2 retains all the exciting components as the original Super Bikes, and is built on a highly reliable system featuring RIO and DELL computers.